Everybody into the water From one to ten, and from "diez" to "uno," counting is featured in this swimmy, finny underwater concept book. With opposites, "short, long / corto, largo"; descriptions, "yellow, blue/amarillo, azul"; action words "swim, dive / nadar, saltar"; and rhyme, a lot of language arts fill this lively lake. Teachers and parents of ESL students will cheer when they discover the Hola, English series, as will those seeking to expose English-speaking kids to Spanish. 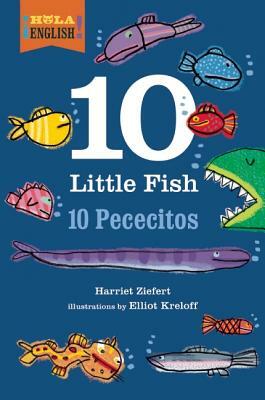 "Ten Little Fish" combines numbers with simple adjectives ("fish above, fish below; seven fish, fast and slow") and simple verbs ("swim and dive fish, here are five fish").